Property 7: Located in the heart of "Mayberry"
Property 8: **Lovely Salt Lake suburban Ski/Vacation home! Property 11: Well appointed private guest suite in the S Broadway area, minutes to downtown. Property 17: New Private Forest Retreat: No Pet or Cleaning Fees! Property 23: Rebecca’s Nest-A Creekside Retreat! Property 35: Anaconda City. 3 bedroom , 2 bath with fenced yard and Garage. 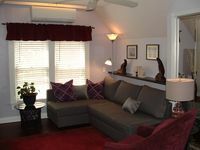 Property 43: Two bright rooms in charming 1910 Old Town cottage. Comfort, convenience, and superb location! Property 48: Comfort, convenience, and superb location! Property 50: Location! 7 min to downtown/ convention center/ airport. Quiet neighborhood. Great place to stay! Wonderful location. We walked to several great dinner spots and ice cream. Well maintained. Check-in was very easy. Walt is close by if you need anything. Loved the large bathroom! Definitely recommend as a great place to stay for your getaway, or even business downtown!